This is a genuine and very rare World War II British Military sailing canoe. It was designed and built by Warwick Aviation in late 1944/ early 1945. Constructed in Aluminium to aircraft specifications. The canoe comes in five main sections so that it could be transported in submarines or seaplanes. Each section is watertight. Front and rear sections have round hatches so can be used as storage areas, handy for limpet mines etc. The center section has two seats, compass (or machine gun?) mount, anchor mount and mast fitting. There was a steering wheel fitted but I have removed this as it is not origional and was an obstruction. Two outriggers are attached to the center section via an sliding mount which allows them to be locked in an outer position for sailing or an inner position for paddling. They can also be folded over for storage or removed completely. The outriggers are filled with "ping pong" balls so still float when holed (handy for when the bullets start to fly). 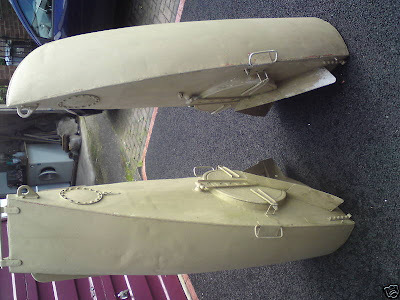 A folding rudder clips onto the rear section (the rudder has been restored). Designated "MOST SECRET" it was designed to be used by sections of the "Small Operations Group" such as the "Combined Operations Pilotage Parties" and " Detachment 385 " in the far east in Commando style raids. They were tested in Ceylon (now Sri Lanka) by Blondie Hasler who was one of the two survivors from the Famous "Cockleshell Heros" raid. The canoe will come with a copy of the book "Cockleshell Canoes" which details the design, construction and use of these small boats. The front cover of the book shows a MK 7 with its sail up. 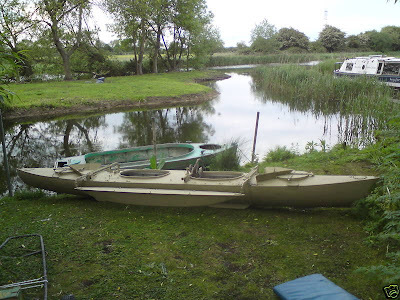 The canoe is in relatively good condition for its age having spent most of its time in a garage. There are a few small dents and the paint is rough. 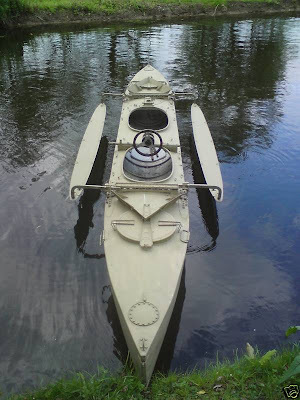 I have been using it on my local river, sometimes with an electric outboard strapped to the side. I guess it travels at 7mph, it cuts through the water and makes a lovely sound as the bow wave interacts with the outriggers. I have recieved lots of interest on the river as it is the most unusual thing on the water! I find it very easy to put together and carry but it is good to have two people to lift the main section if the outriggers are attached. There are a few loose rivets in the front and rear section so there are very slow leaks which have never been a problem on any of my trips. The main section is watertight as are the outriggers. There are a few of these canoes in museums and a couple in private hands.